I ate a wonderful Salisbury steak the other day with a thick brown gravy. The gravy made me think of all the mystery meat I’ve eaten over the years both in the public school system and then later in the military. I realized that a nice gravy can make just about anything taste good. I have always viewed denominational differences within Christianity as a case of “same meat, different gravy.” A person from an academic background might better relate to the intellectual aspects of God’s nature and seek out a church that emphasizes those facets. An artist might better relate to God’s beauty, and so forth. Growing up, my father was pastor of a small Baptist church. Because it was the only church in town, our music leader was Methodist, our piano player Assemblies of God, our church secretary Catholic, and our membership a variety of other denominations. It was wonderful seeing so many Christians from such varied backgrounds united in worship and service to the same Lord and Savior! I view this unity as ideal and get to experience it a little bit today through the homeschooling community, which tends to be predominately Christian, but of varied denominational backgrounds. Nonetheless, I think God does make provision for our unique personalities and needs by providing a variety of ways to worship and serve Him. First is when the gravy is so thick and rich and nuanced that any flavor from the meat itself is completely lost. Second is when we add to the gospel message. 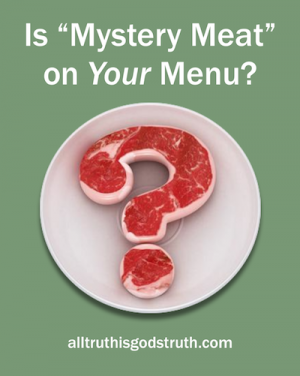 Have you ever bitten into some “mystery meat” and wondered what exactly you were eating? Third is when we take away from the gospel message. We want to cut away the tough parts that are hard to chew. If we can avoid these three errors, I think that there is a lot of “wiggle room” in how and when and where we serve and worship the One who uniquely created each of us in His own image. All organizations have a hierarchy. It’s impossible to function well without one. But being a leader isn’t the same as being a dictator. The best role model is Jesus Christ, not Joseph Stalin. The best leaders exhibit several qualities: They are transparent; they expect as much or more of themselves as of those they’re attempting to lead; and they put the good of the organization (or, in the case of a husband-leader, the good of the family) ahead of their own interests or any personal gain. First and foremost, a servant-leader is transparent. Transparency implies there are no hidden agendas. Everyone is on the same team, working toward the same goals, and those goals are clearly defined and understood. Transparency means honesty, fairness, forthrightness, and above all, accountability. Transparency with a spouse can be difficult. Some things are hard to talk about with anybody, let alone with someone we care about, someone of the opposite gender, someone whose admiration and respect we so deeply crave. A good rule of thumb is, if you’d be uncomfortable discussing it afterward with your wife, then you probably shouldn’t be doing it in the first place. 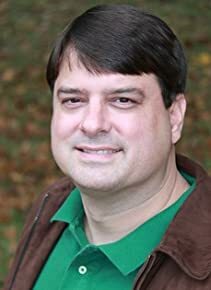 Of course, personality differences can make even innocent discussions more difficult than they should be — I dreaded telling my sentimental wife when I recently traded in an old Ford truck she loved for two small economy cars, even though it made good financial sense to do so — but that isn’t what I’m talking about here. When it comes to being transparent with our children, that can be hard, too, but it is important that they know our weaknesses as well as our strengths, our failures as well as our victories. Because our kids share our humanity as well as our genes, their weaknesses will often mirror our own, and they’ll benefit from hearing how we’ve overcome various struggles. There is no need to go into great detail about your failings, but don’t pretend you are without faults. A servant-leader is quick to accept blame, apologize, and ask forgiveness whenever the situation warrants it. And he understands the importance of maintaining a clear conscience and therefore strives to behave in a way—both publicly and privately—that is honorable, dependable, and above reproach. Second, a servant-leader is not above the law. Nor does he consider himself above the law. The US Congress provides a classic example of the opposite of this principle, routinely passing bad legislation from which the lawmakers themselves are exempt. With a true servant-leader there is no such hypocrisy. The rules are applied equally to all. He expects as much or more of himself as of the people he leads, for he knows that as their leader, he will incur a stricter judgment. The father who smokes two packs a day, but warns his kids to never take up the habit? He isn’t doing himself, his children, or his health any favors. I want them to hear me out, although I often interrupt. I expect them to be patient and thoughtful and self-controlled, even when I haven’t been. I would like for them to look their best, even if I skip shaving or look a little shabby myself. I want them to control their emotions and refrain from pouting, crying, or acting moody in any way, yet sometimes I fail to control the temper that provokes such moodiness, sulkiness, and tears. The take-home message? We need to be and do the things we want our wives and children to be and do. We should expect as much or more of ourselves as we do of them. We must lead by example. Third, a servant-leader thinks of others first. I’ve known both styles of leaders: Those who use the organization to serve themselves, and those who use themselves to serve the organization. Although I’ve crossed paths with a few embezzlers over the years, embezzlement is not the only way to steal from a company. It’s just the most obvious way. Many people manipulate vacation schedules, work assignments, and tax credits to their own benefit. They are always watching out for number one, always looking for loopholes. Whatever will garner the best perks or put the most money in their pocket with the least amount of effort is what they will do, every time — whether it’s ethical or not. A servant-leader is the opposite. He does what is best for those he serves, even when it requires great personal sacrifice to do so. For the family man, this may mean driving mini-vans instead of sports cars, going on family vacations instead of golfing excursions, living in a modest home in suburbia instead of a high-rise apartment in the city, or getting braces for Junior instead of that new flat-screen TV. The term “servant-leader” is what Buddhists would call a koan — a seemingly contradictory statement that forces a person to stop and think more deeply about a subject, so as to bring about an even greater enlightenment. Yet leaders should serve those they lead. The only reason servant-leadership seems like a koan or an oxymoron to our society today is because we have grown so accustomed to leaders who abuse their power and use it to benefit themselves, often to the detriment of the people they are supposed to represent. Plato felt that those who most desire to rule are least suited to do so, because they invariably have ulterior motives. His solution was that leaders be conscripted into service the way soldiers are drafted into the military. In a sense, the Biblical command for husbands to be leaders in their homes is exactly that — men being conscripted by God to serve their wives and children. Unfortunately, most men are not natural leaders, nor do they naturally love their wives in the self-sacrificing, Christ-like way God commands. If these things came naturally, there’d be no need for the associated directives in Scripture. Commands in Scripture almost always run counter to our natural inclinations and underscore our need for the supernatural intervention of a loving Savior! Do you long for your wife to shower you with respect and admiration? Do you wish she would follow your lead without arguing or questioning your every decision? You will never get the results you are looking for by being harsh and demanding. Even if you were to gain her cooperation, it would be given begrudgingly. That isn’t what godly servant-leadership looks like. If you want your wife to follow your lead, then you must walk in a way that is worthy of respect. Lead in a way that inspires your family to follow. Lead prayerfully. Lead gently. Guide them with humility, understanding, patience, faithfulness, temperance, and love. As a husband, the responsibility falls to you for taking the lead in improving your marriage. Don’t blame your wife for your own failures in this area. You must work to earn her trust and confidence. Prove yourself to be a man of integrity, a person who thinks things through — not a man who is shortsighted or rash or vindictive. It is a sobering proposition to be the spiritual head of one’s home, to be held accountable before God for the spiritual health and welfare of one’s family. Such a heavy responsibility calls for a posture of prayer. Pray that God will enable you to relate to your wife and children as a wise servant-leader should: Love wholeheartedly. Love sacrificially. Love unconditionally. Love extravagantly. Consistently shower your wife with that brand of love, and chances are, it will eventually win her over. She’ll then happily follow you to the ends of the earth. But what if it doesn’t? What if she won’t? Then you’ve got to keep loving. Love her, because God has commanded you to love her — not because of what you stand to gain from doing so. Love her and keep loving her, because you want to be obedient to Him. He will receive the glory from your doing so. And that is the only success that will matter in the end. As the father of four daughters myself, I found this man’s laissez-faire attitude to be a little unsettling. I believe a dad has a moral obligation to protect his children from harm, to prepare them for life, and to provide wise counsel along the way — all of which calls for a hands-on approach to parenting. GOD makes the rules. And His way is better than anything we could dream up. I know that none of the men who date (or eventually marry) my daughters will be perfect. I don’t expect them to be. But I do expect them to have hearts on fire for Jesus. I pray that they’ll follow His example. I want them to love my daughters with an enduring, committed, self-sacrificing love. What sort of rules or guidelines have you set for your sons and daughters when it comes to dating? Tell us about them in the comment section below. Want a “Dating Rules” T-Shirt for yourself or someone you love? They’re available here in a variety of colors. (Please note that the graphic is on the front of the shirt, not the back). 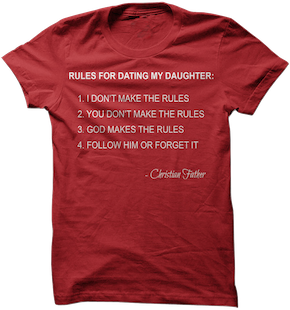 A Christian Father’s Rules for Dating My Daughter first appeared on All Truth is God’s Truth. Children may not be born with an instruction manual, but there’s still lots of good guidance available, beginning with the Bible. Here are seven simple but scriptural principles my wife and I have found useful in raising our twelve children, five of whom are now adults. We actually begin praying for our children before they are even conceived. Our foremost prayer is that each one comes to know Christ. It would be better never to be conceived than to spend eternity separated from God. We are always surprised by what our children consider the most significant moments in their lives. Often our best talks are ones on the way to the grocery store to grab some milk, and our best “vacations” are the unplanned ones arranged for us courtesy of the US Army Reserves. Patience has two varieties: The first is in dealing with the day-to-day stuff that can really get on your nerves. The second type is more in the category of perseverance and involves hanging in there for years at a time while your child slowly finds their place in the world. My wife and I were both blessed with parents who always told us we could do anything we set our minds to. Because we believed them, neither of us have ever been afraid to try anything new or challenging. We’ve been determined to pass that same blessing on to our own children. The Internet didn’t even exist when my wife and I started our family. Now we have a four-year-old who knows how to access learning videos on her mother’s smartphone. Likewise, a hundred years ago, you were more likely to be thrown from a horse than run over by a car. New dangers are constantly appearing on the horizon, and your child’s best tool for dealing with them will be the one resting between her two ears, assuming you train her to use it well. Money is of limited usefulness when it comes to having a happy and fulfilling life. Too little, and life is a struggle. Too much, and life quickly becomes materialistic and vain. The optimal window is actually quite small. 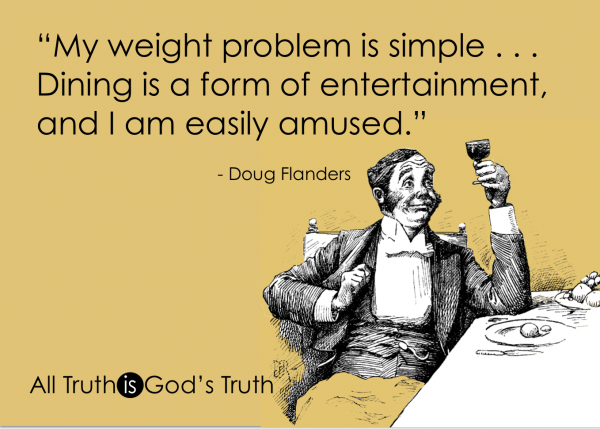 Learning to be content with what we have, so we can focus on weightier things, is a challenge for us all.